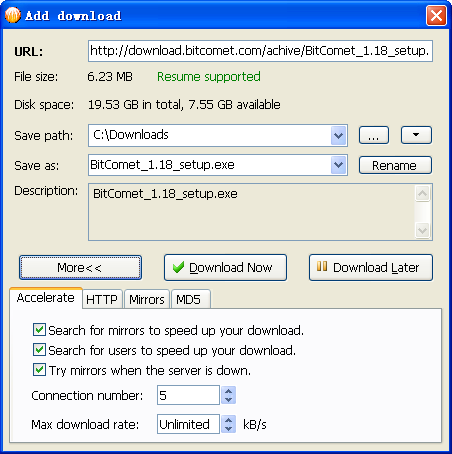 BitComet is a BitTorrent/HTTP/FTP download management software, which is powerful, fast, very easy-to-use, and completely FREE. It contains many advanced features that can accelerate your downloading up to 5 - 10 times faster, or even more. 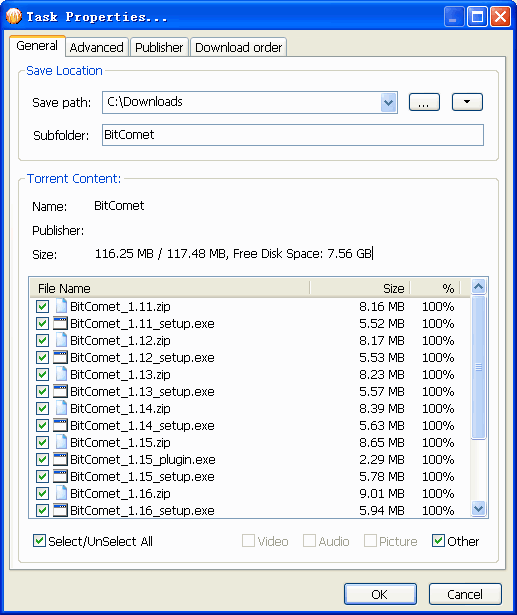 Taking a slightly different approach to solving the multimedia lover's dilemma of how best to download torrents is BitComet, which uses an interface heavily cribbed from Windows Explorer--with a dose or two from the basic BitTorrent template--to create something instantly recognizable to the user. · Preview while Downloading: Preview of MP3, rmvb, wmv, and qt is available during downloading process. · Intelligent Connection Optimization: Configuration is automatically set to match your connection type. · Intelligent Disk Cache: Memory cache is used to reduce the read/write frequency of your hard drive, therefore increasing service life. · Quick Resume: The torrents can be seeded or resumed immediately without time consuming scans. · NAT Traversal: Users behind NAT can now connect with each other by UDP. · Auto Config UPNP port mapping in router (UPnP support is required in router, Windows XP is required). · Option of Disabling and Setting Priority of Files in any torrent: Files can be disabled, so they are not downloaded, or set to higher or lower priority, allowing you to select which files finish first. · Trackerless support (Mainline DHT): Torrents can be downloaded when tracker is offline using DHT. · Support for Multi-tracker, and utf-8 extension, UDP tracker Protocol v2. · Ability of Multi-Section Download: Files are split into several sections which are downloaded at the same time to increase the download speed up to 500% or more. · Ability of Multi-Mirror download: Mirror servers are automatically found for the file being downloaded. Data from these servers are downloaded at the same time to increase download speed 300% or more. · Ability of Multi-Peer download: BitTorrent technology is integrated into HTTP/FTP protocol, with which BitComet automatically finds other peers and gets data from them to increase your download speed without additional bandwidth usage of the HTTP server. · Support for Unicode: Multi-language web pages and encoded URLs can be correctly handled. · Quick Resume: Stopped download tasks can be resumed from where they left off from both HTTP and FTP servers. 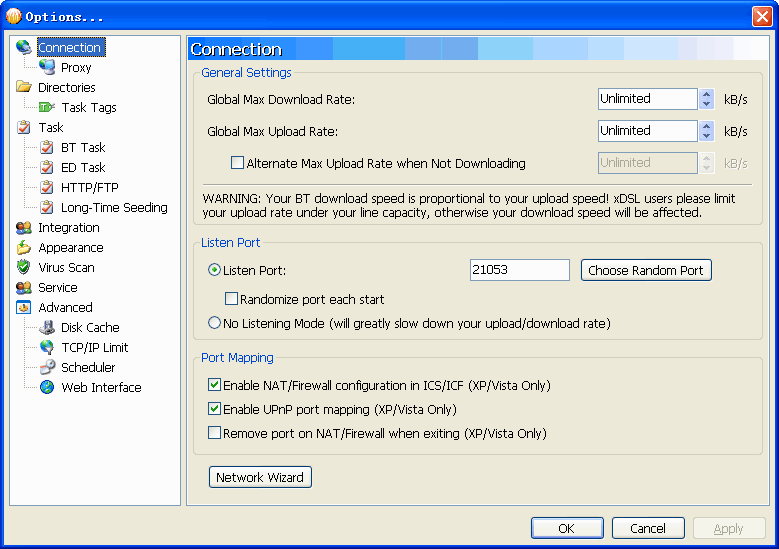 · Global and Per-Task Speed Limit, for Both Upload and Download. · BitComet does not contain any adware or spyware.